Photographs by Jeff Goldberg, courtesy of Polshek & Partners (now Ennead Architects). 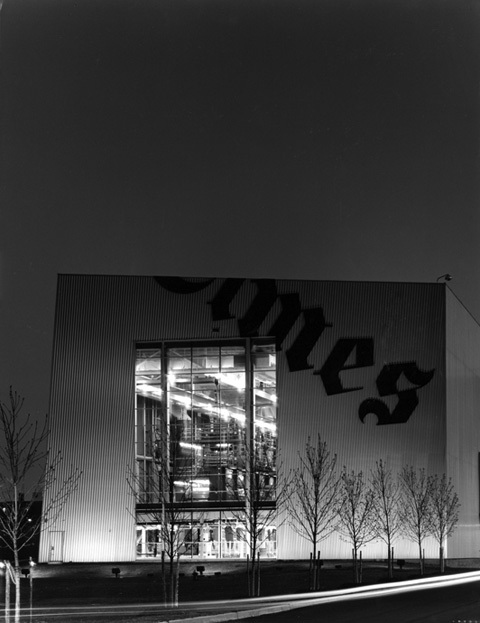 In 1997, vertical re-organization contributed to an innovative 515,000 sq ft printing facility for The New York Times in College Point, Queens on the Whitestone Expressway. Design by James Stuart Polshek & Partners with Parsons Main, the primary volume is a corrugated metal box with 600 ft-long window displaying the working of the presses. Colored volumes articulate the different phases of production: a yellow gatehouse leads to an entry plaza with a crossword-puzzle pavement; a red canopy signals the entrance; a blue high-bay box stores paper; and yellow wedge-shaped boxes filter the ink fumes. Inside, a mezzanine balcony wraps through the building, providing views down to the pressrooms where columns spaced 30 feet apart double as supports for vertical conveyor belts. The entire process is automated, from delivery to production: bar-coded rolls of paper arrive by truck and are scanned; they are moved to a track and stripped, then brought to printing presses by robots. The printed papers travel via conveyors to the third floor's 50,000 sq m storage room with its Muller Martini system allowing for individual sections to be printed separately, then assembled. Once completed, the newspaper is fed by a conveyor through an opening in the floor to the mailroom below. This vertical organization brings manufacturing distances together and reduces the production costs.